The Russians wouldn’t want the Turks to choose between Russia and the US; they’d want to bring the US on their side to have a bigger coalition so that instead of competing they could collaborate, said political analyst and Middle East expert Ammar Waqqaf. 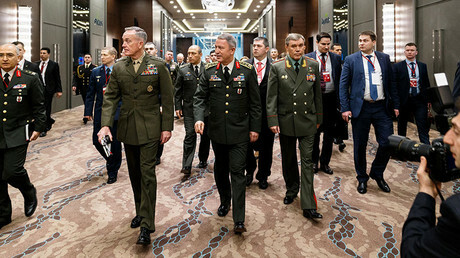 Russia's Chief of the General Staff Valery Gerasimov has taken part in a surprise meeting with counterparts from Turkey and the US in the Turkish city of Antalya. The focus of the discussion was on security issues in Syria and Iraq, the Russian Ministry of Defense (MoD) said in a statement. On Monday, the Pentagon confirmed a small number of US troops had been sent to the northern Syrian town of Manbij to deter fighting between the US-backed Kurdish forces and Turkish-backed rebels. 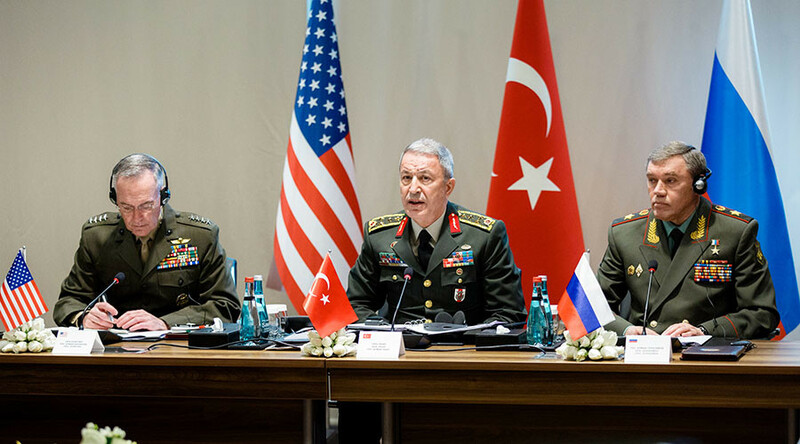 RT: How important is this top-level military meeting in your opinion? Ammar Waqqaf: It is important. Yesterday, the Prime Minister of Turkey Binali Yıldırım, said there wouldn’t be or couldn’t be a Turkish operation toward Manbij without coordination with Russia and the US. And there you go, within 24 hours we have this top-level meeting. There are tactical issues surrounding Manbij, but there are also other strategic issues. With regards to Manbij, the whole Euphrates Shield Operation, when it started, Turkey had requested that all Kurdish militia withdraw or evacuate to the east of the Euphrates and this had some sort of sympathy from the US. This didn’t technically happen, although we’ve heard of some withdrawals here and there. But obviously the militia is still there, and now they’ve linked up with the Syrian army. So the Turks probably are trying to push the point that this is what we’ve agreed upon: we need to evacuate to the east of the Euphrates, but then the Syrian Army linking with the YPG are now destined to be handed over some villages to prevent the Turks from doing something. So, there is this tactical, complicated situation around Manbij first of all that needs to be solved. And I think this meeting in large part is going to focus on that. RT: Do you think any significant decisions will be taken? AW: There is also the strategic issue of how the US is going to approach its involvement in Syria. We’ve seen over the past month the US actively participating in the liberation of Palmyra for the second time. We’ve had statements from the US-led coalition that the US-led air forces – they have bombed ISIS positions and forces around Palmyra which is a significant development in this war. It is the first clear-cut from the previous administration’s position of using ISIS as some sort of a pressure card against the Syrian state, against its Russian ally. Now the US is doing exactly what it is saying, it is fighting ISIS, so this is actually a big development. But how to continue, how to conclude this operation of defeating ISIS needs a lot of coordination. The Turks are saying that they could play a part in liberating Raqqa. The Russians are saying the Syrian army is best suited to do this. The Americans, they have their own involvement with the Kurdish militia. This also needs to be discussed and options put on the table in order to nick into shape the ideas of how to go forward on this. RT: Relations between Ankara and Washington are pretty tense now especially over the situation in Manbij. Do you think the two sides are actually capable of finding a compromise? AW: Let’s take it from the Russia’s perspective. The Russians wouldn’t want the Turks to choose either Russia or America. They would probably also want to bring America to their side in order to have some sort of a group or a bigger coalition than there already is. So, instead of competing, they could coordinate or collaborate. The Turks probably ditched the position of the previous administration and went with Russia probably hoping the new administration would come and say: “You don’t need to go closer to Russia more than this and we can help you.” And this is not happening yet. So, there is a bit of tension. But hopefully, everyone is going to come on the same side and participate in a larger push to defeat terrorism in Syria and Iraq.